Sure, I love to travel because nothing enriches the mind, body and soul more than seeing the world. Learning about new cultures. Meeting new people. But you know what I secretly live for? The food! There’s nothing I love more than feasting upon authentic new flavours, and I’ve been to some pretty incredible food capitals. My favourite to date? Hong Kong. I still dream about that Dim Sum! But Mexico was a close second. You haven’t experienced Mexican food until you’ve had a real street taco – #gamechanger! 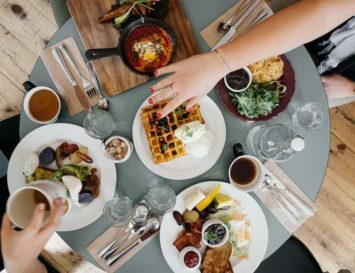 But while the world is slowly opening up for the vegan community, so many popular street foods are made with heaps of meat and dairy – not ideal! Luckily, I’ve found some vegan street food recipes that we all need to try. So, now you can pretty much travel the world from your very own kitchen. Cool, huh? Bubble tea has become increasingly popular in the last year or two, but it’s actually a Taiwanese tea-based beverage that combines milk with a variety of flavours. It’s then topped with chewy tapioca balls. Serve it up either hot or cold, either way it’s both delicious and refreshing! Make it vegan by using plant-based milk, like this recipe that uses creamy almond milk. Esquites, which means ‘toasted corn’ is pretty much a cup of corn and is a popular Mexican snack that you’ll find in shops and on market stalls. You could shuck your corn for this recipe or just grill them whole, either way the end result is mouth-wateringly good thanks to the array of flavours. Think cilantro, lime zest, and a sriracha mayo . . . yum! 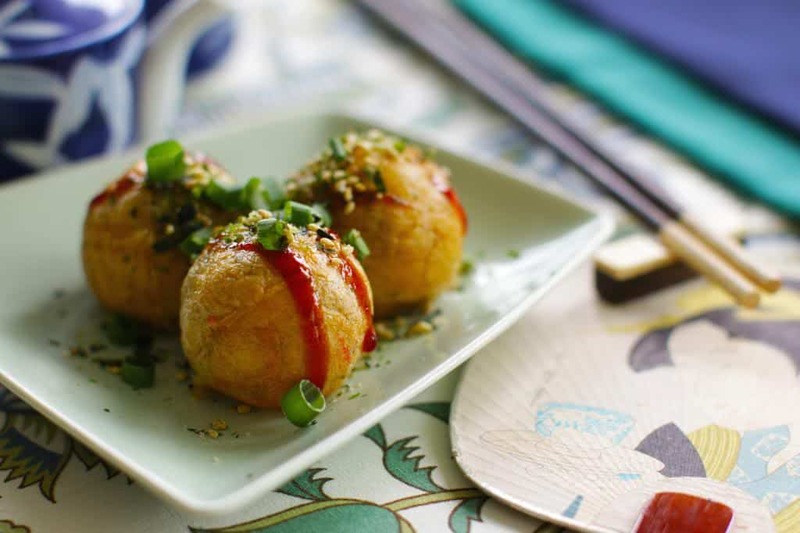 Takoyaki are a Japanese ball-shaped fried snack that is commonly nicknamed ‘octopus balls’ – yikes! Not very vegan-friendly! So, I’ve found a recipe that is not only meat-free, but can be easily moulded using a cake pop mold, too. Take your taste buds on a trip to Mexico! Tlayuda is pretty simple to make, yet full of flavour. A large, thin and crunchy tortilla is topped with a spread of refried beans, meat, lettuce or cabbage, avocado, cheese and salsa. This recipe keeps it 100% vegan, yet just as delicious as the authentic version. 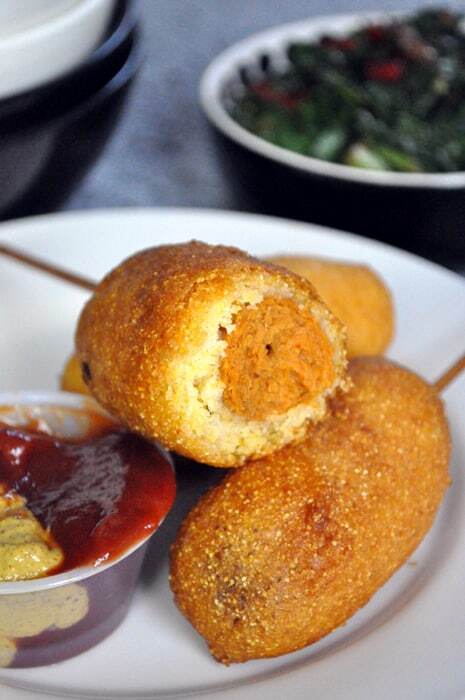 Arancini balls are literally H-E-A-V-E-N! 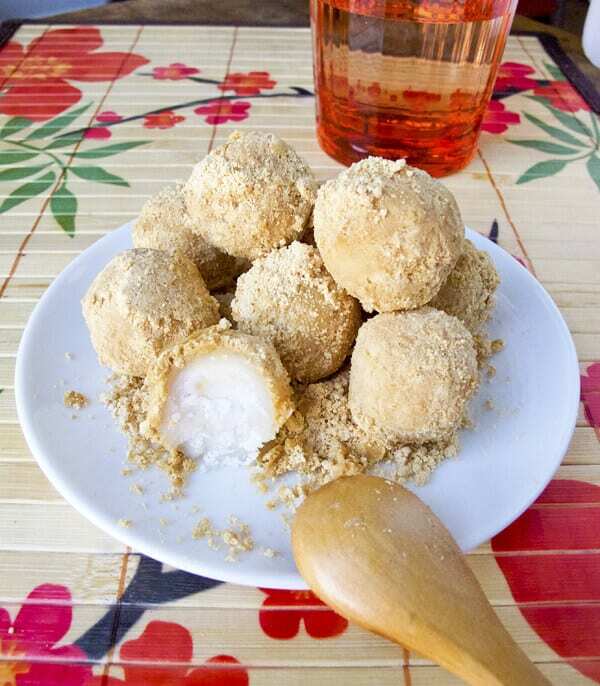 The Southern Italian dish is basically stuffed rice balls coated in delicious breadcrumbs and then deep fried. Yep, I know, real healthy! But oh-so-worth it. And these balls have been veganized and filled with creamy mushroom and fragrant thyme. Warning: you won’t be able to eat ‘just the one’ of these bad boys! These Sicilian fritters are made from chickpea flour, and they’re a popular street food in Palermo. They’re often eaten in a sandwich, a bit like a crisp sarnie! But they’re just as good as a stand-alone snack and are best enjoyed piping hot. If you’ve seen every film ever set in America, you will have more than likely seen them how down on a corn dog at some stage. For years I was curious as to what they really were, and I’ve since learnt that they’re a hot dog covered in a maize-flour batter, fried and then served on a stick. They’re pretty easy to make vegan; just use a meat-free hot dog, or if you prefer, a roasted carrot. 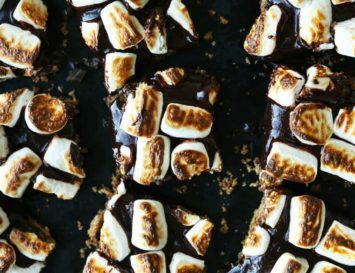 This recipe is a twist on the traditional (and tasty as hell!) Colombian (or Venezuelan) arepa, which is normally stuffed with foods like fresh ricotta cheese and spicy roasted vegetables. This quick and easy vegan version requires just 4 ingredients and is ready in 15 minutes. Korea is popular for its Korean fried ‘chikin’ and is consumed as a meal, an appetizer and even as a snack. You could buy mock chicken to make it vegan, but cauliflower makes a really good substitute for meat. Forget the mushy vegetable you were served as a kid; once baked or roasted, cauliflower gets a meat-like texture to it that’s really enjoyable. This dish is also visually stunning, thanks to the vibrant red pepper sauce and cooling cucumber yogurt dip. 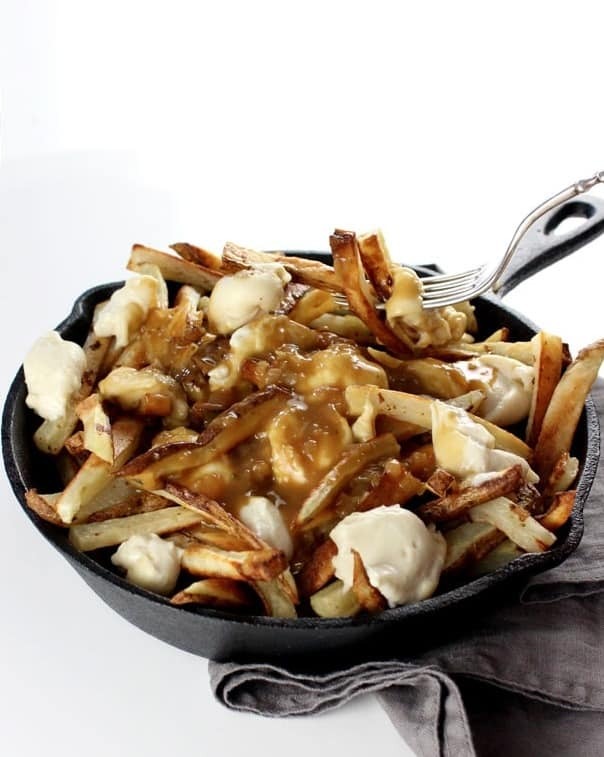 Popular in Canada, this is a serious comfort food that consists of French fries and cheese curds (curdled milk) topped with a brown gravy. Some of the fries in this vegan version are wonderfully and crunchy, some are soggy and soaked in gravy. Glorious comfort food! Thank you, Canada! Otherwise known as a ‘Taiwanese hamburger’, a bao is a popular street food in Taiwan and is a dough that has been steamed into a bun or a roll, sliced open and stuffed with pork belly or duck. They puff up and become super fluffy. 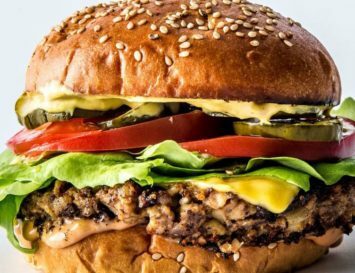 This vegan version is stuffed with delicious BBQ pulled jackfruit alongside some delicious, crunchy veggies! Currywurst is pretty much what all junk food is; super cheap and wonderfully cheerful! This German street food is super popular and is pretty simple. 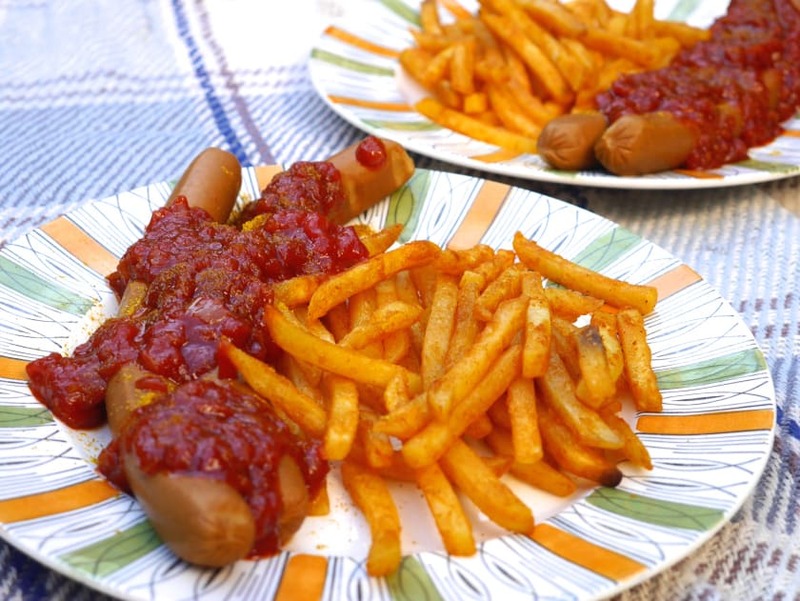 Fried sausages are served with curry seasoned ketchup and fries. It’s pretty easy to make vegan, just find some vegan hot dogs and away you go! I lived on dumplings when I visited Hong Kong. It’s surprising how something so small can be so filling! They’re pretty easy to make vega: just use veggies inside, or a mock-meat if you’re looking to recreate a meat dumpling. Serve alongside some vegan-friendly soy sauce. Basically the Subway of Vietnam, a Banh Mi is a baguette that has been sliced and filled with a variety of ingredients, typically meats, pickled vegetables and chilli. This vegan recipe is savoury with caramelized cauliflower, sriracha mayo and quick pickled veggies. In total it takes just 30 mins to perfect this hearty sandwich. You’re welcome. Jamaica is famous for its jerk chicken, and if you’ve never had the seasoning before then you’ve gotta try it but be warned: it’s hella spicy! These vegan chickpea wings are amazing, and the jerk sauce pairs well with the sweet mango dip. Anyone else salivating? Ceviche is a quick, common Peruvian seafood dish made from raw fish that has been cured in citrus juices, such as lemon or lime, and then spiced with chilli peppers among other ingredients such as chopped onions, salt and cilantro. This seafood-free citrus ceviche is wonderfully light and refreshing, making it a perfect appetizer, side salad or party dip. This typical Turkish dish of baked filled pastries is made using a thin, flaky dough such as phyllo, and then by stuffing them with cheese, spinach or minced meat. This vegan börek is stuffed with a spicy tomato filling and is super yum by itself, or even more delicious dipped in a vegan yogurt sauce. 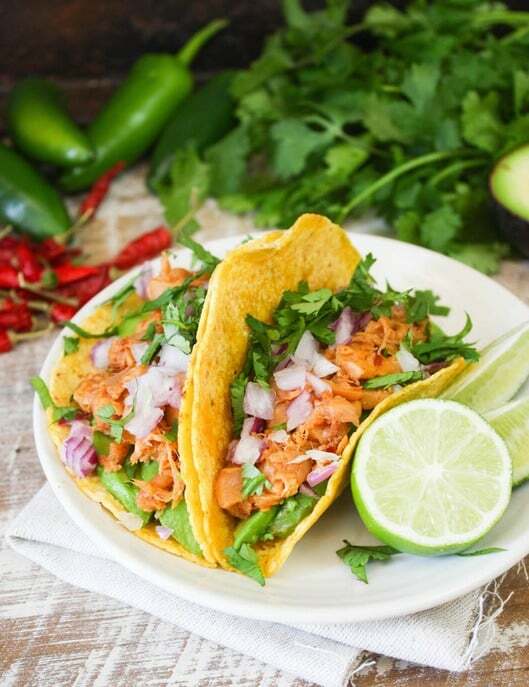 Unlike the American-style taco that is made with a crispy shell, authentic street tacos are made using soft corn tortillas and filled with grilled or pan-fried chicken, beef or pork – but you know what? Jackfruit is so, so much better! 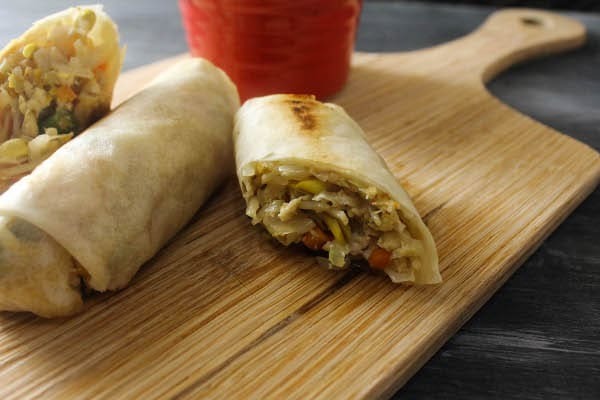 Lumpia is a Filipino spring roll and is typically filled with pork and vegetables and then deep fried to crispy, golden perfection. This vegetarian version filled with goodies such as sweet potato, tofu, green beans, carrots, cabbage and bean sprouts and then baked to make them just a tad healthier – but no less delish! Beef or chicken satay is a staple Indonesian street food, and easy to make vegan from home – just use tofu! This high-protein dish is marinated and then baked to make the tofu crispy and super flavoursome. Damn, but tamales are good! This traditional Mesoamerican dough dish is steamed in a corn husk or a banana leaf, which works as a makeshift plate when it comes to eating. 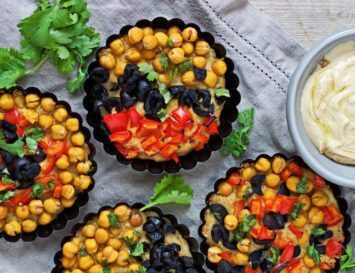 Usually filled with meat, these vegan versions are loaded with hearty meat-free ingredients such as sweet potatoes and black beans. They’re also missing the lard that normally goes in to moisten the corn – thank goodness, right? Oh, but I do love me a pretzel! My favourite is sugar and cinnamon, but I’m also partial to a savoury one, too. These are a popular street snack in the US, and they’re super delicious when they’re still warm from the oven. Yum! 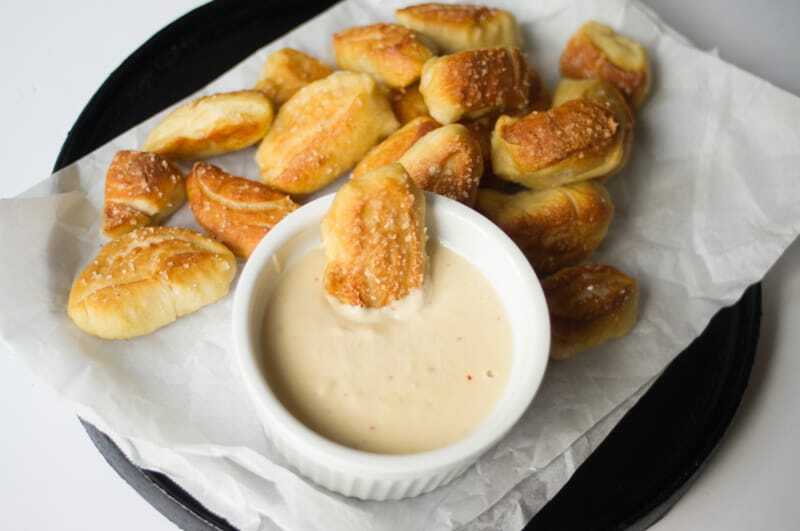 This recipe makes tiny pretzel bites with a cool vegan beer cheese dip to dunk them in. If you’ve never had Indian street food before, you need to try pakoras, like, right now! Otherwise known as an onion bhaji, a pakora is a fried onion snack. 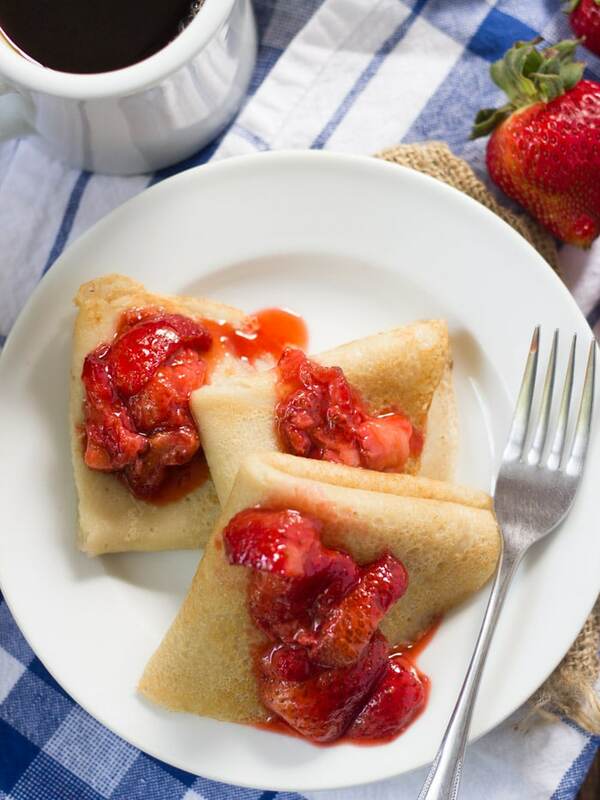 They’re crispy and delicious, and using chickpea flour makes them gluten-free, too. These oval dumplings are pretty much a festival in your mouth. They can typically be boiled and eaten as a side dish with a little melted butter on top, but are often cooked in soups and stews, too. Can you really go wrong with fried dough? 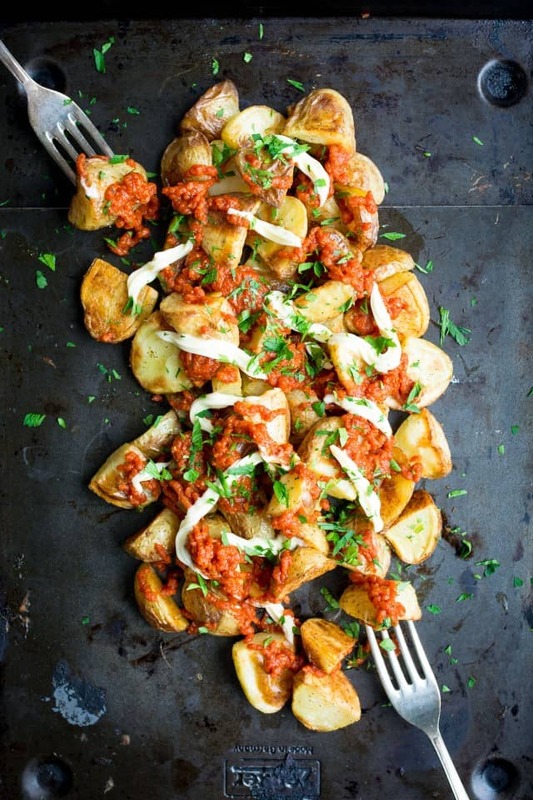 A favourite in Spain, patatas bravas are ‘taters in a spicy tomato sauce. This tapas dish is often ordered in bars and eaten outdoors at bistro tables, and is super easy to make. Otherwise known as a Portuguese custard tart, pastel de nata is an custard pastry dusted with cinnamon. The pastry is flaky and golden and filled with a sweet and creamy custard and then finished with a sprinkle of icing sugar. These are super simple to make vegan, and are the perfect sweet treat with a fresh cuppa! Baklava is a rich, sweet Greek dessert pastry that is made with layers of filo and filled with chopped nuts. 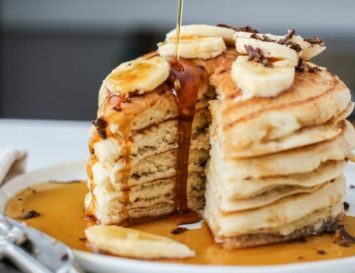 It’s typically sweetened and held together with either a sweet syrup or honey, but this recipe keeps it vegan by using agave syrup. Instead of just pistachios, it also used almonds and walnuts, too. The first time I tasted churros, I was hooked! And what’s not to love? fried-dough pastry that is dusted with cinnamon or sugar. They’re heavenly devoured warm, but I also love dipping them into some melted chocolate, mmm! These popular Japanese dumplings are very similar to mochi. Dusted with a sweet and salty roasted soy flour, they have a sticky, chewing and fluffy texture and ooze sweetness bite after bite. When in Paris, I can never resist a street crepe! Mine used to be filled with Nutella – until I found out they use palm oil. Now, I’ll take them with bananas or lemon and sugar, thanks! 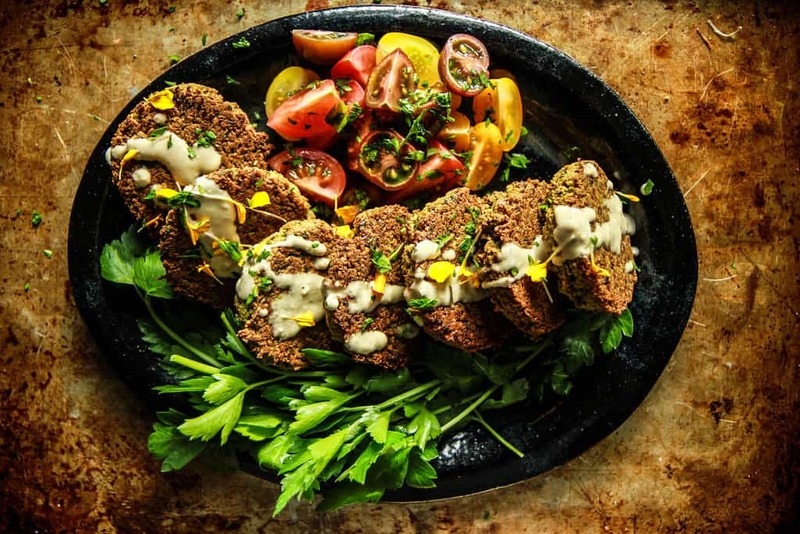 Main image: Vegan falafel plate. Get the recipe here. Great collection of vegan street foods! 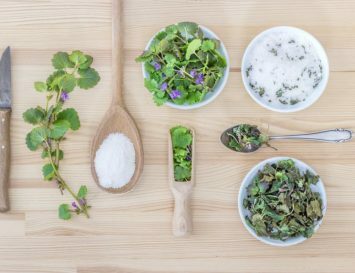 Great round up of plant-based street foods! Thanks Kristina! 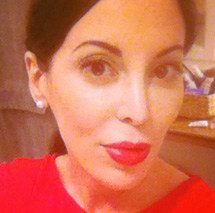 Try the arepos – just discovered them and LOVE!